I haven't posted about Boeing's 787 Dreamliner in a while, since the program seems to have developed a keen ability to lull us into a sort of impatient trance. Each time previously when we began to get excited about Dreamliner, somehow the program would sing us a lullaby and we'd go back to that mysterious place, a place that takes from us our ability to care much about the 787 program's endless delays...waiting, and waiting before moving on to the next aviation story. The Boeing 787 Dreamliner that will fly later this quarter has moved from the paint hangar to the flight line. Fuel testing - the first in the next phase of extensive checks the airplane must undergo - will begin in the next few days. 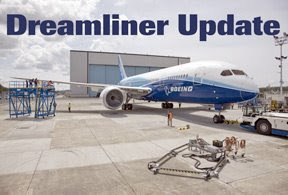 "We are making great progress, and moving ever-closer to first flight," said Scott Fancher, vice president and general manager of the 787 Dreamliner program. In recent weeks, the 787 completed a rigorous series of tests including build verification tests, structures and systems integration tests, landing gear swings and factory gauntlet, which is the full simulation of the first flight using the actual airplane. With Chief Pilot Mike Carriker at the controls, the simulation tested all flight controls, hardware and software. The simulation also included manual and automatic landings and an extensive suite of subsequent ground tests. All structural tests required on the static airframe prior to first flight also are complete. The final test occurred April 21 when the wing and trailing edges were subjected to their limit load - the highest loads expected to be seen in service. The load is about the same as the airplane experiencing 2.5 times the force of gravity. On April 13, the leading edge of the wing was subjected to its limit load while the rest of the airplane was subjected to loads expected at cruise. And in September 2008, the "high blow" high-pressure test was completed on the static airframe. During that test, the airframe reached an internal pressure of 150 percent of the maximum levels expected to be seen in service. On the slate now are additional power and systems tests as well as engine run-ups. After completing a series of high-speed taxi tests, Boeing vows to launch later this quarter, which means by the end of June. And according to their latest Dreamliner press release, their order book shows 886 airplanes ordered from 57 customers. And you can just about bet the farm those 57 customers are as ready as anyone to see the coolest airliner ever actually fly.